Must I make costly replacement of ONIX with PEX? I have new a Laars Minitherm JV225NDISU2 natural gas forced hot water boiler with six zones of baseboard. When the previous owner added a kitchen and dining area in 2004 they added the sixth zone and also expanded the basement zone. 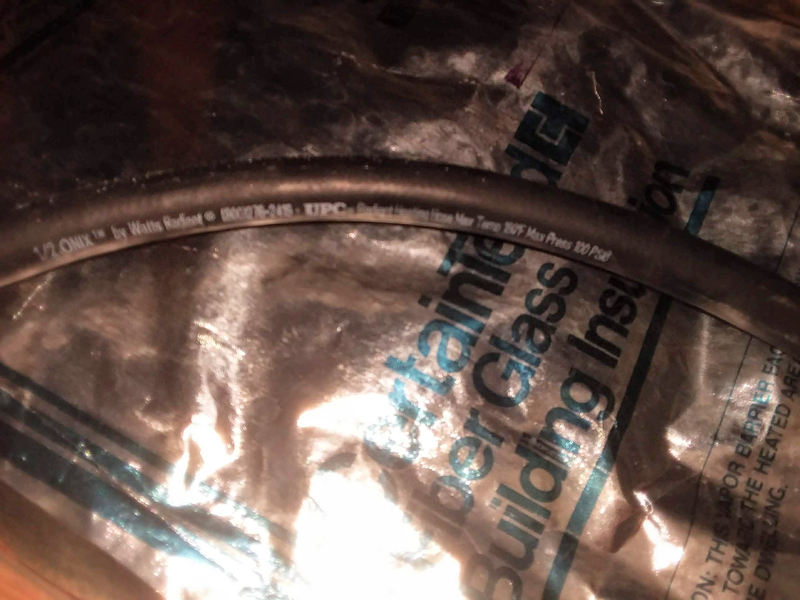 The tubing that returns from the kitchen and basement baseboards is black rubber “½ ONIX” instead of the peach-colored plastic “PEX” and copper that connects the rest of the heating system. My boiler guy says I should replace the ONIX tubing with proper PEX tubing. 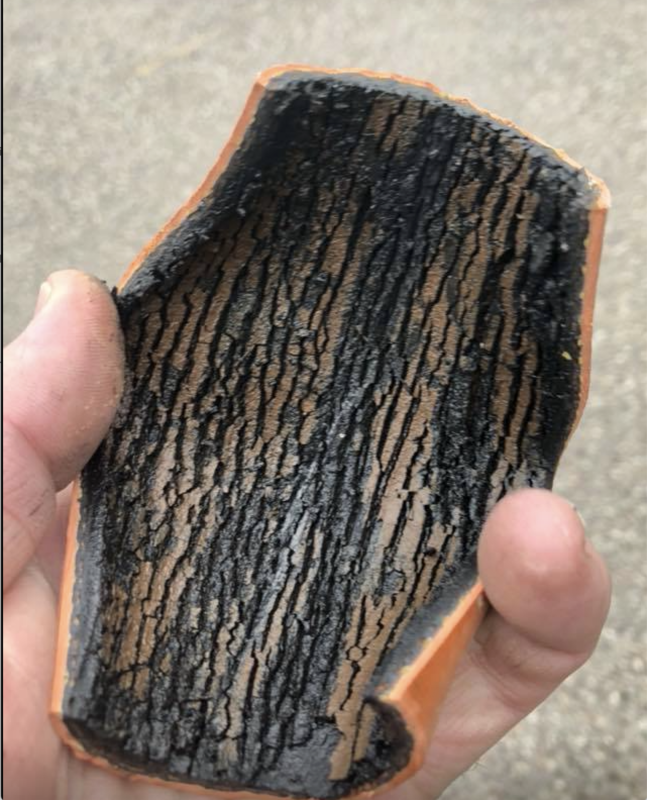 He says the rubber is deteriorating and will eventually gum up the pumps and may leak because it is not rated for the high temperature of the boiler. He drained some water from the boiler to show me its dark color. The water was fresh/clear in July. He says I should hire a plumber. Do you think the tubing should be replaced? Will it leak or just gum up the pumps? Replacing the tubing is a huge job because there is no access under the kitchen - the crawl space is blocked by a beam - so the plumber would have to cut through the floor. Also, the basement tubing is behind walls. And a bedroom above the kitchen also uses ONIX. Replacing the ONIX is such a big job that it may be cheaper to replace pumps as needed. Say again? Onix tubing -- a registered trademark of Watts -- is perfectly good provided the temperature never goes about 180 F, which is rated maximum temperature. Pretty much the same as other types of PEX tubing. It's not rubber -- it's EPDM, which is a different beast entirely. I agree with Kevin, we see that problem too often here. Power flush, add DI water with hydronic inhibitors and check inhibitor yearly as per manufacturer. @hot rod_7 What is DI water? Also, boiler was installed in July, so the water was clean at that point. deionized or DM demineralized water. Water that has been stripped of all the minerals, all the + and - ions. You want H2O basically. Add hydronic conditioner to that purified water to buffer ph, scavenge O2 and add a film provider. A good cleaning and power flush with high pressure may be the best first step. 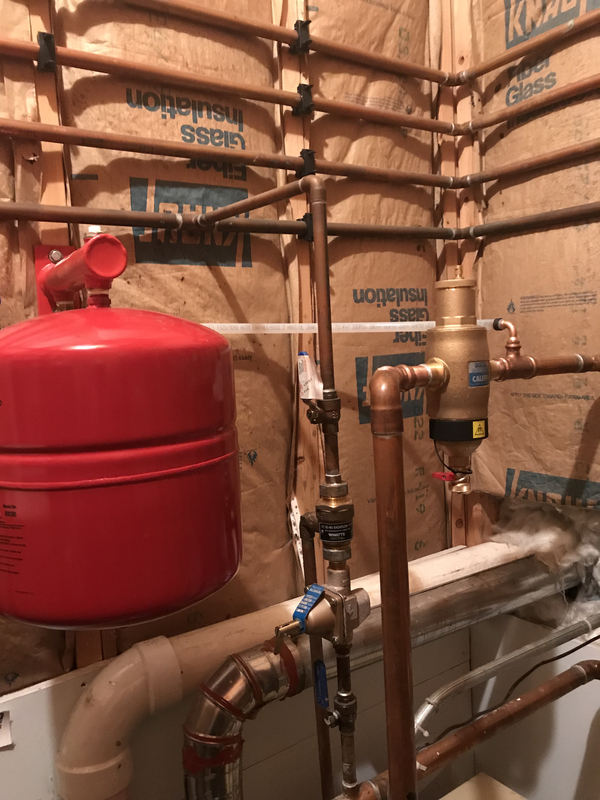 @Jamie Hall : do forced hot water boilers like my Laars Minitherm ever put out higher than 180F? I watched the thermometer on my boiler as it was firing and the burner shut off at 175F. Also, just to be clear, the ONIX and PEX have the same maximum temperature, 180F? @kcopp, so the ONIX is not breaking down at high temperature. It is letting oxygen into the water which is rusting the iron and making dark water. I agree the system should be flushed with a cleaner. I'm not hearing any warning that the ONIX is going to start leaking, which would be a disaster. I'm hearing that the problem with dark water is that eventually the pumps and valves get clogged. In the systems I have seen that have Onix I didn't see the tubing breaking down... I have seen I one case the connections had some weeping. Also the higher the water temperature the more of an issue w/ oxygen.This can pertain to PEX tubing also. @hot rod_7 Thanks for the excellent article. Also read the one on separation. In order to flush system do I need input and output spigots plumbed into the system? I let a glass of brown boiler water settle overnight. The sediment is fine and brown. I saw no effect on contact with a cabinet magnet or a hide-a-key magnet. I'm not sure I did it correctly, but now I think it is non-ferrous. No odor. I'm north of Boston and our water is not hard. The benefit of the inhibitor would be to decrease corrosion more so than decrease scaling. The article I really want to see is "No that dirty water is not from ONIX breakdown." I think my boiler installer wants to push future clogs on me as he thinks the brown is from ONIX breakdown. With regards to the separation article, I have copper baseboards and did not see air vents on them. Should there be? There is a cast iron air purger and float-type air vent above the expansion tank. It sounds like a dirt separator with magnet would be a good addition, but I'm not sure there is room for it. Watt’s Radiant says the brown water is the result of rusting of the iron parts of the system, not of breakdown. ONIX is made of EPDM, the same material used for steam hoses and can operate up to 210F. They say the system should be flushed with a cleaner and a corrosion inhibitor applied and yearly checks that the water is not acidic. Laars says there is no known problem using their boiler with ONIX. ONIX has an oxygen barrier. Most baseboard systems use a 180F setpoint. They say the system should be flushed and an inhibitor applied. The boiler uses copper tubes and is compatible with most cleaners and inhibitors. Sentinel, Fernox, and Rhomar have been recommended. Unusual stuff happens with some of those rubber tube systems that you never see in pex, even non barrier pex. 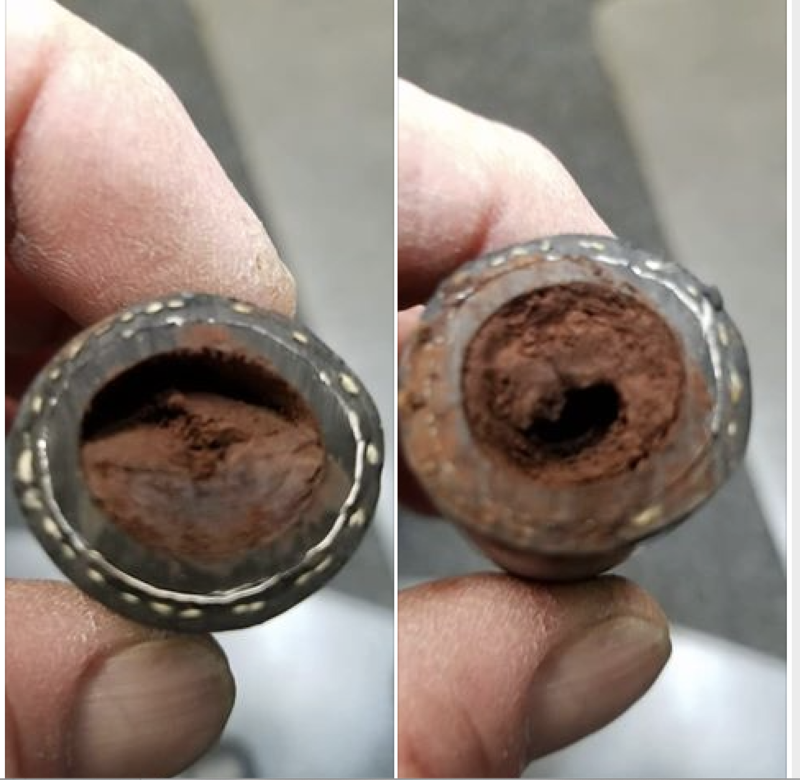 I think clay is one of the components used in the process, some suspect it breaks out of the tube somehow, and that may be what the sludge is? If you talk with contractors in areas where 100's of thousands of feet of that tube is installed, sludge is a fairly common problem. Oddly not all of the early Entran systems failed, the tube could be glass brittle for several feet and perfectly fine a few feet away, a very inconsistent failure. It must have something to do with the blending of the components in the hose? @hot rod_7 Are those photos of Entran or Onix? Is a problem with ONIX documented? I've done a lot of searches since my boiler guy told me to rip up my house and I can't find it. You mention the contractors with a lot of tubing installed - how are they managing the problem short of ripping it out? Is a dirt separator enough? Inhibitors? Annual flush? The black sludge stuff is Onix, the orange could be Entran or Onix, depending on the year it was manufactured. I don't recall what year that was, when the color changes, probably when manufacturing switched away from Goodyear. If it gets sludged to the point where it cannot be opened with high pressure flush pumps, it is abandoned. Tends to be the low points, like basements where the sludge settles. Some contractors isolate the tube from the boiler with a plate HX and use non ferrous components and a chemical regiment and yearly testing. I don't have direct experience with ONIX systems and sounds like from the results you are seeing more corrosion than tubing degredgation. But, KCopp already pointed out, the hotter the water and the longer the runs the more of an oxygen infiltration issue there is, even with a diffusion barrier and I don't know if EPDM resists those high temperatures forever. As hotrod pointed out, one way to address that vis-a-vis protecting the core of your system from the runs that are assumed to be leading to corrosion is to isolate the water in those loops using heat exchanger , either plate style or repurposed indirect DHW tank. Especially if you use a plate style though you would still want good dirt separator filtration on the return as the fine passages can be clogged. But with a stainless heat exchanger and a stainless pump on that circuit you can cut corrosion to almost nil, but if you now or eventually get 'rubber' materials degredation, i.e. fine black gunk, that won't be rectified and must still be guarded against for plate style heat exchanger. Corrosion is addressable. You can get various cleaners and treatments and if its already a mess that would be a good idea, but i will admit to being lazy regarding cleaning and corrosion additives. 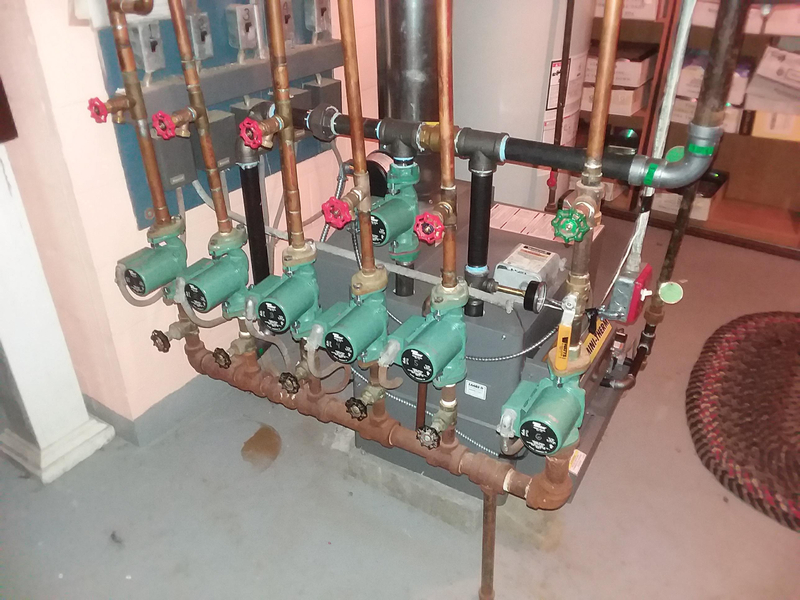 I feel like hydronic equipment should be designed to deal with its envrionment and worst case tendencies. And I had to worry about this virtually from the start because I have a lot of non-barrier polybutyl tubing radiant floors in place which would require jackhammers to replace which i'm guessing is more expensive even than your onix feeds. Luckily most of these installs were add-ons and the pricey early automated mixing valves and concern about low return temp in non-condensing boilers lead me to use indirect heaters from the get go which meant that I got the corrosion protection before oxygen diffusion had been identified as a problem. All that said, I worry more about materials sloughing in older rubberized material although I don't have any installed ONIX so I've never seen any of it after a decade in service. 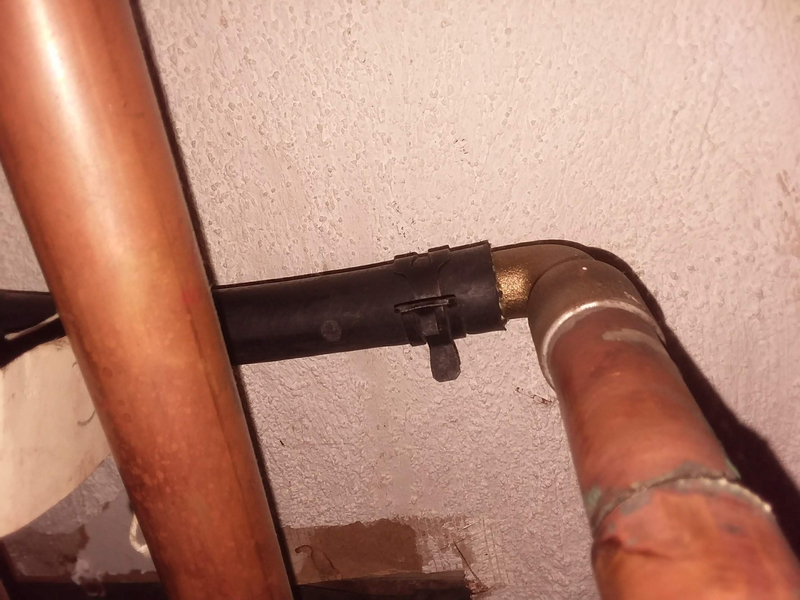 Although it is not a cure all, depending on how much fintube you actually have in your baseboard you could consider adding setback capabilities so the water doesn't run as hot during shoulder season. 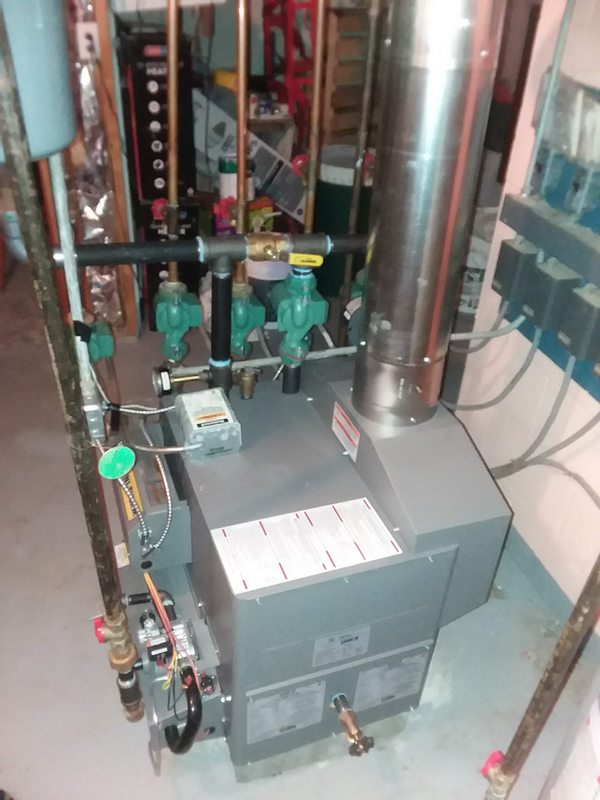 You need to keep return temp above 140 since you don't have condensing boiler, but that might ease up on the temperature challenge to the tubing during a good deal of the year. Going up to that bedroom is a vertical challenge in the same vein. i've made some pretty sweet chases/fishes for 1/2" pex. The size of the runs is advantageous compared to working with 3/4". Assuming you have to make some horizontal way in finished parts of the basement, we have run pex (both for up feed to first floor and down feed to a basement loop) in the ceiling corners of finished basement rooms and put a crown molding over it. All testimony is that you don't have to replace the ONIX but it might not be as insurmountable as it appears at first blush. If you are adding ups and downs to the loop this would mean you want to insure good bleeding and, for the most part, i rely on isolating loops and draw offs at both ends of the loops moreso that vents for baseboard. I see the draw offs on your returns. i can't see where the feeds split, and my guess is just before that is where your expansion tank and water entry from pressure reducint valve is which is technically wrong, but you literally can't pump away from a multi-pump on return system as yours is set up. That said. it its been working, keep air purged and leave well enough alone (virtually no one uses the iron scoops anymore but not looking for stuff that ain't broke). Maybe somebody can explain the bypass pump i see on the feed that maybe is keyed to circulate on cold start up until the boiler hits 140 to prevent condensing or . . . ? Doesn't all the current ONIX have an aluminum o2 barrier? Is that still permeable? 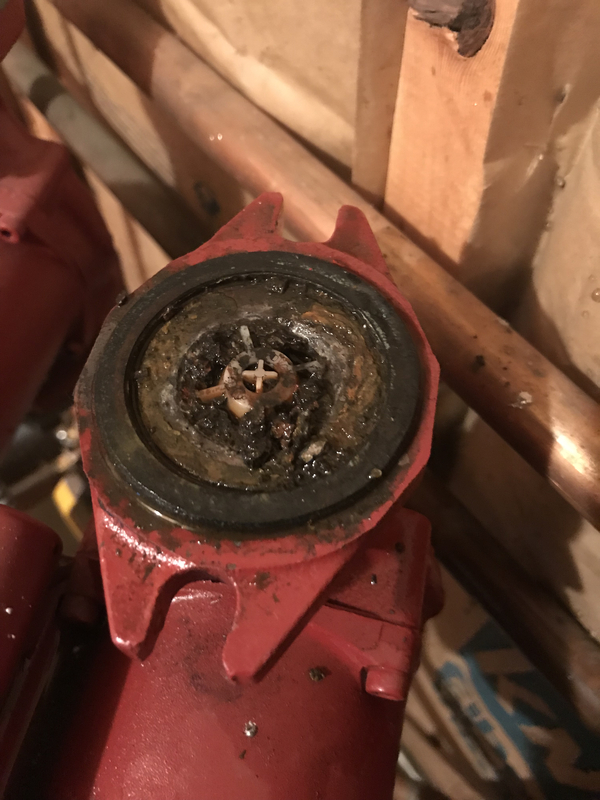 I would make sure the system has an exceptional dirt separator, learn how to clean the pumps yourself if that is an ongoing concern, and do whatever other reasonable preventative maintenance has been mentioned already in this thread. If there's some easy runs that can be replaced, so be it, but otherwise, if it ain't broke, why fix? This is a project that would be best to synchronize with some other home remodel or repair issue ten years down the road. 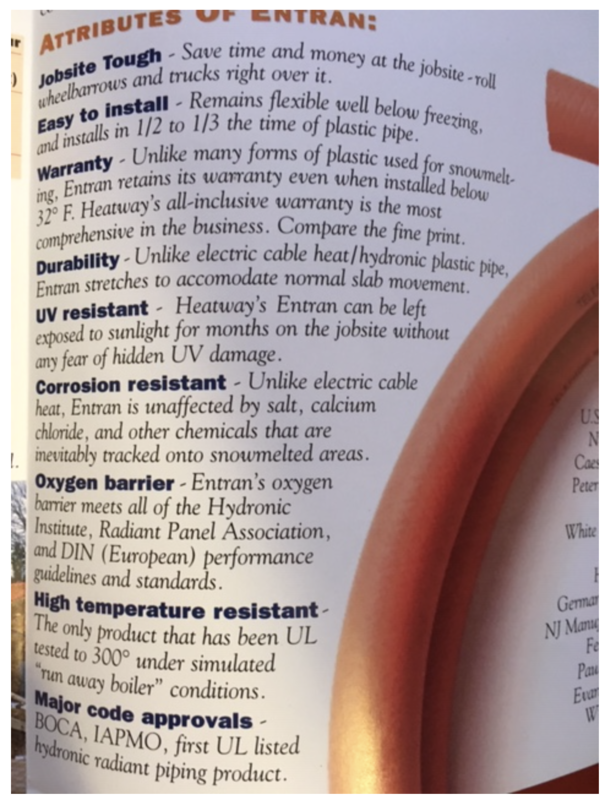 @Eastman, if it is not against the forum rules to name names, what would you recommend for "an exceptional dirt separator?" The brown particles are pretty fine. Could be clay as per hot rod_7. I saw no response to a magnet. Even so, the separator should have a magnet. Perhaps I should have the water analyzed. When they took out the old boiler, the water was black. Today the water is brown. To be sure, there is no dirt separator at all currently, correct? The pix I posted of the Caleffi 5461 is a combi Air/ dirt separator and it has a magnet. You can get just the dirt version but why not do a magnetize version if you are going to all the trouble. The Onix is Supposed to have an aluminum O2 barrier but from the MANY installs I have seen with it installed both radiant floor and baseboard set ups it is not very effective. I have bought a Rhomar/ Kamco power flush cart last year and it does a really nice job flushing out the junk from the tubing and systems. I thought the aluminum O2 barrier was added recently, but I don't really remember. Hasn't there been different varieties over the years with and without various o2 barriers? Caleffi makes good stuff. That filter that kcopp mentioned would be my pick. But do the other stuff mentioned, too, though. Allegedly it has always had an O2 barrier, I think this is about a 1995 ad. From what I have seen if the sludge is black and sticks to a magnet, that indicates O2 is getting in on and ongoing basis and breaking down ferrous components. The brown sludge is still questionable, and some suggest the inner tube is breaking down? If the system is not connected to a fill system, and cleaned and filled at first install, where else would the crud be coming from? Especially enough to completely block loops beyond salvage? There have been a number of versions of that tube, the O2 barrier, and other layers has been beefed up over the years, currently with aluminum. temperature listed has been lowered, this older Entran ad states UL tested to 300°F! What do you think about "side stream" filters that have a fine mesh? It seems like that style of filter would excel at collecting mystery goop. As long as someone maintained the filter. I'd rather not depend on a filter to keep the system healthy, but in this case. @archibald tuttle thanks for the encouraging words about fishing tubing. Maybe replacement is more doable than I thought but hopefully I can fix problem with cleaning, inhibitor, and dirt separator. I have 272 ft. of baseboard. Boiler has outdoor reset installed. You said you "can't see where the feeds split." Here is a photo. I think the new air/dirt separator could fit where the old cast iron air separator is. You say "you literally can't pump away from a multi-pump on return system as yours is set up" Is the problem that the boiler pump is the same size as the zone pumps and must handle all their flow? UPDATE: I got results back from the Rhomar water testing lab. My boiler water has "significant brown magnetic sediments", high chlorides, and high dissolved iron. Basically rust. Not broken-down rubber. Since the new boiler is copper and has not had time to rust the sediment must have been left in the system due to incomplete flushing. Perhaps sediments have collected in the basement baseboards which are slightly below the level of the boiler output and would not have flushed by simply draining the system. I’m going to try to convince the boiler installer, who was advancing the ONIX breakdown story, to apply a cleaner then power flush and apply a corrosion inhibitor. If that does not clear up the water, I will add the dirt separator. Any advice on flushing, especially on the basement zone? There is a spigot on the boiler and one on each zone. Is that sufficient for a power flush? How is a cleaner physically added? It seems if you open a spigot, water will flow out. How long should it circulate? The pH is tending alkaline. The water hardness is not an issue. However, the chlorides are high and considering there being no corrosion inhibitors in the fluid, this may explain the observed spike in the levels of corrosion by-products – magnetic sediments, high levels of dissolved iron and some copper. This may also be the result of the system not having been cleaned properly prior to the installation of the new boiler. We would therefore infer that the fluid contains predominantly iron oxide. The sediments will accelerate wear and tear of the new boiler. a) Remove the current fluid from system. Flush it with water followed by cleaning with Hydro-SolvTM 9100. Once completely clean, flush the cleaner out with water (make sure all cleaner has been flushed out). b) Fill the system back up with water treated with Pro-TekTM 921.
c) If freeze and or burst protection in addition to corrosion protection are desired, ThermaGardTM is recommended. didn't mean to desert you on the pump away question but really not particularly relevant to this thread, just an observation from pics. i have tried to noodle on pumping away on systems that have multiple pumps on the return but really what you have to do is put the pumps on the feeds but that is really only if you have complicated system that airlocks problematically which is not your problem. the only way to pump away from multiple return pumps is to have a separate expansion tank and pressure reducing fill for each return leg on the baseboard side of the pump. (i suppose it is theoretically possible to have a single fill with check valves running to all six legs but the fills are unreliable enough over the medium term, i can't imagine that amount of piping is worth it. just as easy to move the pumps or reverse the piping and boiler outlets leaving the pumps more or less where they are, but again, i have many systems that were plumbed this way before anyone thought about this and when the pump on the return was the industry standard, and they are working fine so i wasn't really encouraging any additional work. You can purchase the cleaner in aerosol cans now. I think a 12 oz can does 35 gallons of fluid. It has a female hose connection, screw it into and hose connection into the system. Tightly! as once you pull the trigger the can empties in seconds. Rhomar sells the treatment in these easy to use cans. You will need a flush pump or flush cart to get enough flow and velocity to scrub out those heavy particles. A basic purge with a fill valve, even a 1/2" bypass will not be enough. Typically a 1/2, 3/4 hp or larger pump is required to get enough flow to scour the piping. Find a used swimming pool pump on Craigslist, they move a lot off gpm. Hire a contractor that has the equipment to do this right, don't waste money on chemicals if you can't get it flushed properly or the problems will reoccur. 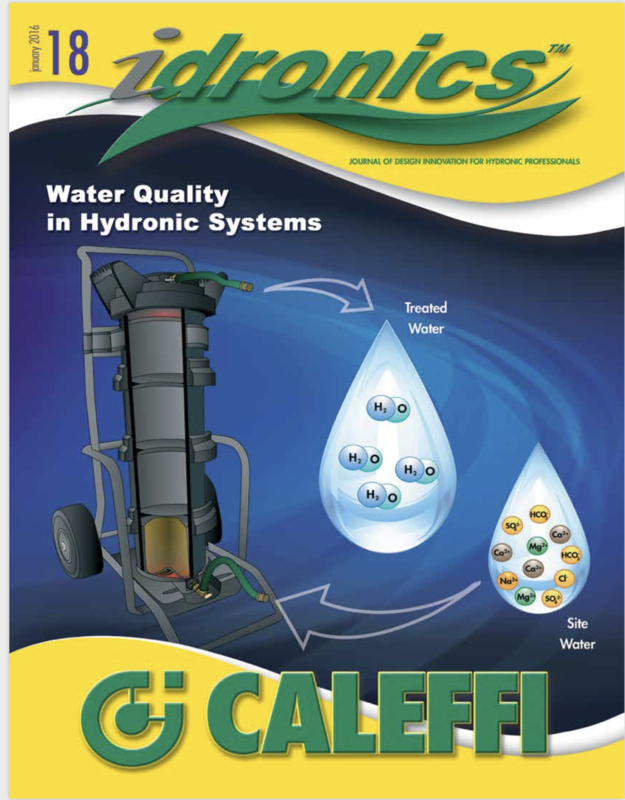 I wouldn't hesitate to install a Caleffi Discal Dirtmag. It's not going to be a solution to all of your Onix woes, but now that you know for sure what is in the sludge an air and dirt separator looks like a must have. UPDATE: @hot_rod @kcopp I scheduled a chemical cleaning, power flush, and corrosion inhibitor, which was agreed on phone. When tech got here he said 1) you can't power flush because the piping is not made for pressure above house level and 2) The chemical cleaning only works on a condensing boiler, not my conventional boiler. I'm unhappy! I thought if the inhibitor did not do the trick then I'd go for the dirt separator/magnet. But now I feel the system has not really been cleaned. other than the boiler itself, most all hydronic components, circulators, pipe, fittings, etc are rated at 100 psi or more. 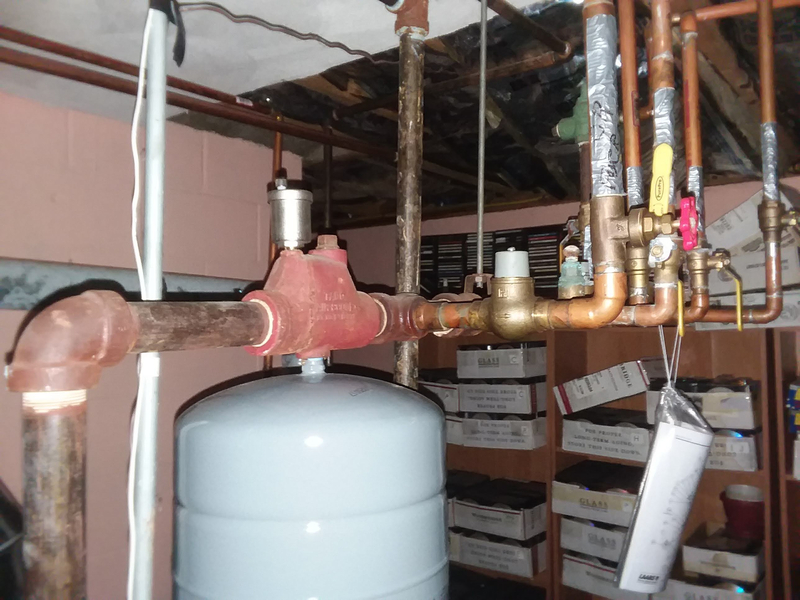 The boiler, usually protected with a 30 lb relief valve would need to be isolated from any high pressure flush. A power flush is not necessarily a high pressure, just a high flow rate to move the heavy particles through the system, the pump for flushing may not exceed 40 psi or so in most cases. The hydronic cleaners are merely a high powered, hydronic specific detergent, really. they are blended to work with all metals found in todays hydronic systems. So the concept is the cleaner gets added and circulated for a few days at high temperature if possible, then the system is power flushed with an external pump. Clean low TDS water is added back in, a conditioner chemical as the last step. UPDATE: We circulated a chemical cleaner for a week and then flushed and added a corrosion inhibitor. I'll see what the water looks like in a year and then decide next steps, maybe a separator with magnet. Two zones had low flow and the week of cleaning noticeably increased the flow - so something got cleaned out. I'm optimistic about the inhibitor. At this point I do not expect to rip out my ONIX. The water testing lab proved that the rubber itself is not degrading but rather there was rust sediment in the water. I believe the ONIX is letting oxygen into the system at the fittings where the ONIX is connected to other tubing. The rust is coming from my iron pipes and hopefully not yet from the iron on the new boiler. Thank you all for the excellent help. I'll report back in a year. If you keep an eye on the condition of the inhibitor you used you may be fine. They have test kits and boost chemicals for most of the boiler conditioner chemicals. It certainly is related to O2 ingress, higher temperatures increase ingress, use outdoor reset to limit high constant SWT. Rust ....... wondering if you have to keep adding water to the system. Water contains dissolved oxygen . If have to replace the lines , I've installed in wall concealed burgler alarm wiring. They have drills on LONG 10+ ft bendable extensions for drilling thru walls. I'ld consider that and drilling a ~ 1/4 inch dia peep hole for a borescope camera before ripping up cabinets or walls. Home depot sells ~ 3 ft boroscope type camera for $100, ebay had a 25 ft China USB one for ~ $25 few years ago. Hand sensors to detect live wires and metal pipes in walls before drilling.